What’s Flowered, Candied and White All Over? Korea’s answer to Valentine’s Day. You see, that hallmark day for lovers here in the East is reserved especially for females to go gaga over their guys, showering them with candies and chocolates. Now, the day has come for prince charming to woo his women — White Day has arrived! White Day, a holiday celebrated in Korea and Japan, marks the day when it is the men’s turns to dote on their lady friends. It’s like having V-Day part deux, spinning companies such as Lotte (who runs approximately half of Korea) into a chocolate-pushing frenzy. Only one month after celebrating Valentine’s, the stores are once again chock full of candies and goodies used to make ladies swoon — but the presents don’t stop at treats. 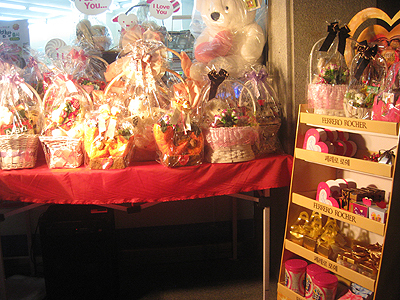 Jewelry, lingerie and marshmallows are also popular gifts for Korean men to give today. 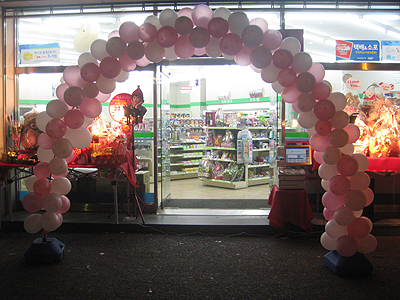 Family Mart and GS 25 were fully prepared for the rush of ill-prepared men who are panicking for a last-minute gift to buy their loved ones. At school, a kindergartener named Jin handed out goody bags to the teachers to celebrate. Score! We made out with two lollipops and about 8 packets of instant coffee — which begs the question, is Jin’s mother (who is a constant fixture in the mornings) trying to tell us something? Zombie reference or no, I’ll take it! 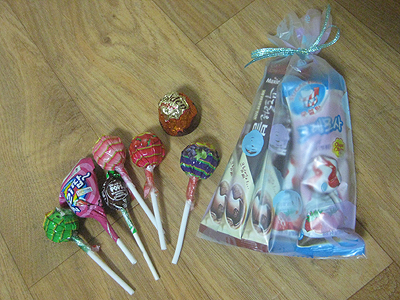 My elementary students gave me gifts as well, including a gaggle of lollipops and a delicious truffle-esque candy. Nom nom. First Pepero Day, then Valentine’s Day, now this? 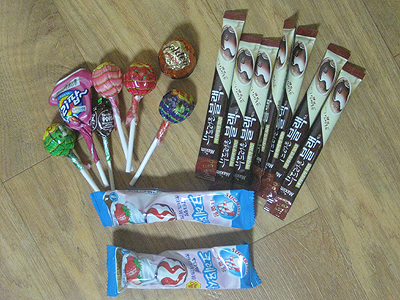 I should move to Korea and start a chocolate manufacturing plant. For real. Next up is Black Day, where all the sassy singles get together to eat jajangmyeon 짜장면, a delectable Chinese/Korean fusion dish that features thick wheat noodles, meat and vegetables slathered in black soybean paste. Evan and I prefer jajangbap (same dish, just made with rice instead of noodles). Seriously, jajang sauce is so good. SO good. We’ve frequented a Chinese fusion eatery in our ‘hood for months now — for pickup and eat-in. A post with food descriptions and drool-worthy pics to come!